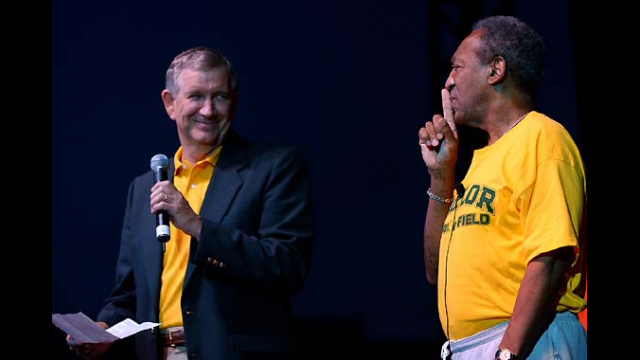 Baylor President Robert B. Sloan Jr. reads the citation recognizing Bill Cosby's accomplishments as an educator, entertainer and parent. 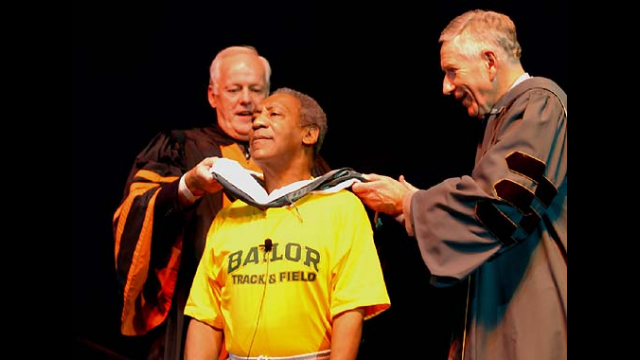 Bill Cosby is presented with the doctoral hood by Provost David Jeffrey (left) and Regents Chairman Drayton McLane Jr. (right). 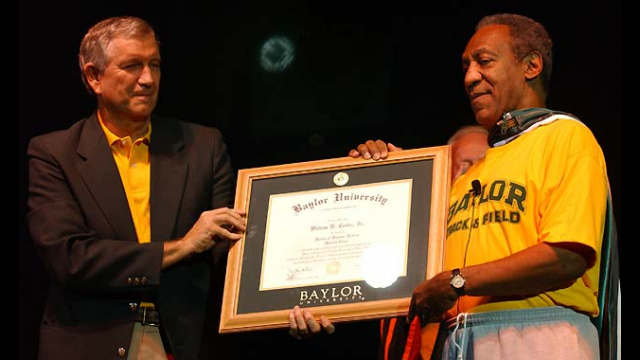 President Sloan presents Cosby with a framed honorary doctor of humane letters degree. NOTE: Degree rescinded by the university on Oct. 8, 2015. Born the son of a sailor and a day maid, William H. Cosby Jr., turned a difficult childhood and an interesting array of friends into the rich tapestry of comedy in his adulthood. His comedic telling of the ordinary folks and activities in his life has never failed to strike a responsive chord with the everyman in each of us and to provide insight into our roles in life. Although he dropped out of school to join the Navy, Dr. Cosby completed his high school studies through correspondence while in the military. Upon his discharge, he enrolled at Temple University on an athletic scholarship, hoping to become a physical education teacher. He completed his bachelor's degree in radio, television and film. After several years in the entertainment business, Dr. Cosby determined to further his education at the University of Massachusetts at Amherst, earning both the master of arts and Ed.D. degrees. The title of his doctoral thesis, "The Integration of Visual Media Via Fat Albert and the Cosby Kids Into the Elementary Schools Culminating as a Teacher Aid to Achieve Increased Learning," serves notice of his pursuit of living and learning as one ideal. Dr. Cosby and his wife Camille, an author, playwright, and producer, are the parents of five children. Sharing his passion and focus on education, she, too, has earned advanced degrees, including the Ed.D. Together they are known for their generosity and encouragement of colleges, social service and civil rights organizations. Their long-standing commitment to education manifests itself through his frequent appearances on college campuses and their generous contributions to many schools, especially predominantly black colleges. He serves as a trustee of his alma mater, Temple University. In 1998, Dr. Cosby was recognized with the Kennedy Center Lifetime Achievement Award. He has received numerous People's Choice and Golden Globe awards, as well as the NAACP Image Award. His life exemplifies the culmination of hard work, discipline, and education. If he had followed life's easy path, our world would never have known this gentle, funny man whose humor nudges us to achieve our best, whatever career we seek or the circumstances of our lives. Bill Cosby - comedian, actor, author, musician, educator, philanthropist, beloved husband and father, friend. Baylor University salutes your commitment to the education of students everywhere and for your enrichment of our lives.